Florence LaBadie has the title role in this one-reel morality play and costume drama from Thanhouser. Her acting presence shines through, and we get a look at what made her one of the first movie stars. The movie begins in 1770, when the portrait is first hung in the home of a genteel colonial family. White men in blackface play the servants, and Florence takes center stage as she watches her own image hung in a prominent part of the house. Her suitor comes over, and, with her father’s indulgent permission, they take a walk together on the grounds. While they are out together, however, another woman rides up on horseback and greets them. 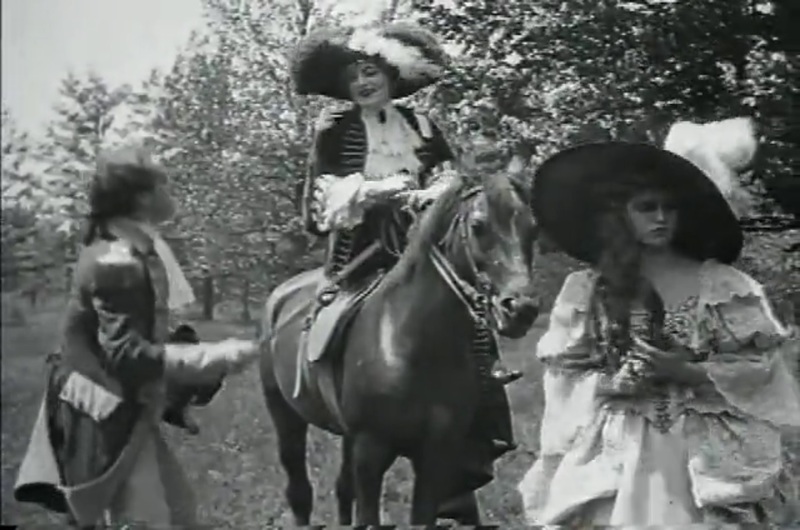 An intertitle tells us that Anne is unreasonably jealous when her fiancé goes over to speak to this other woman and returns her dropped riding crop to her. Once the other woman has ridden off, she removes her engagement ring and throws it on the ground, walking off in a huff while her beau looks despondent. Soon, she’s entertaining another man and receives a note from the first telling her of his intention to go off to war with a broken heart. She immediately agrees when the new man proposes. The next scene shows her rocking the cradle of their child, but a scene of her first fiancé’s presumed death on the battlefield plays as a superimposition over her shoulder. She collapses from regret. Now, the scene moves to modern times, and Florence plays an ancestor of the original Lady Anne. She shows off her resemblance to the portrait at a large party, and invites all the other girls to put on period costumes from the wardrobe. She dresses like her own ancestor in the portrait. The 140-year-old problem begins again when she sees her new boyfriend dancing with another woman, and she runs upstairs. While she’s sulking, the “spirit of Lady Anne” comes down from the portrait and dances with her man, now wanting to heal the mistake made so long ago. Modern Florence climbs down the trestle and sees him kiss the image of herself, then sees the portrait without its picture and somehow figures out what it going on. She manages to forgive him and the spirit is able to rest once again. This very simple little film actually shows how sophisticated movies were getting by 1912. The story is simple enough, but here we see special effects, cross-cutting, and creative camera work, just to get across a very simple idea. The costumes may well have eaten up much of the budget, and I almost get the sense that this story was written to justify using as many colonial-era costumes (especially women’s costumes) as possible. The actors all seem to enjoy the opportunity to dress up and show their ability to act in the unfamiliar garb. I was impressed by the number of camera set-ups as well. The ballroom is actually seen from several angles, including from outside the window, signaling a very sophisticated approach to space, as opposed to the usual stages with entrances and exits that we see from this period. Finally, while most of the editing is chronological, the sequence in which the spirit of Lady Anne comes out of the portrait and is observed by her descendant is edited in simultaneous time, and this allows the tension to build as we wonder if the two Florences will somehow meet and interact. Beyond the technical aspects, the other thing this movie highlights is the star power of Florence LaBadie, who truly lights up the screen in each scene. She goes through several challenging emotional shifts, as she has to become “insanely jealous” quite rapidly after being happy and contented, then show us her regrets and her sorrow, as well as keeping the two characters reasonably clear for the audience. She pulls all of it off well, using expressions and body language to express what words cannot. I only thought she was a bit overstated at one point – when the modern descendant sees the black portrait and mouths “Oh! I get it” to the camera, but on the whole she is a model of the best in silent film acting. It’s easy to see how her fans came to know and love her, even though Thanhouser refused to credit their actors publicly at the time. You can watch it for free: here (also on vimeo: here).